Arrica Rose & the …’s latest full-length release, Low as the Moon (available Sept 8th on pOprOck records), is a collection of 13 originals that nod to the past while sounding thoroughly rooted in the present. No, it doesn’t neatly fit into one specific genre and it’s difficult to draw a direct comparison but that’s precisely what has come to define the sound of Arrica Rose. As the songs flow from delicate Americana balladry to rock ‘n’ roll to retro-tinged pop, the dreaminess of the instrumentation, the sultry vocals, and the artful songwriting allow one track to cohesively weave into the next. The album has its core sound quality and production courtesy of producer / mixer Dan Garcia. It’s a warmth and fidelity we associate with old records but with the addition of omnichord and ambient synths and textures that make Low as the Moon more than a nod to the classics. The album also has a unifying perspective driven by Rose’s imaginative lyrics; lyrics that paint vivid cinematic imagery. Picture the dark lit by a persistent optimism, a hope that balances the despair and calls into focus the silver-lining. Arrica Rose & the …’s are a Los Angeles-based collective playing a unique brand of California folk-pop. Drawing inspiration from timeless records made long ago, Rose’s music hints at dream pop, Americana, and vintage rock ‘n‘ roll all dressed up in dreamy vocals and ethereal soundscapes. Arrica Rose coined the name The …’s (say Dot Dot Dots) to describe the collaborative nature of her project which evolved from a guitar-driven quartet into also including Andrew Sisters-esque harmonies, strings, horns, keys and pretty noise. Rose’s music has garnered praise from iTunes, LA Weekly, LA Record and many more. Her music landed on several ‘Best of Lists’ including #19 on Blurt Magazine’s Top 50, Buzzbands LA top 100 local favorites, Sleepyhollow’s (WXPN) Best 25 Songs. Consequence of Sound described her track “Nothing Nada Nothing” as one of the best indie-rock tracks of the year. Her cover of the Bee Gee’s “Tragedy” was featured by Esquire.com as one of “the best covers of all time”. Arrica Rose & the …’s music has also been featured on MTV’s Real World, MTV’s Road Rules, The CW’s Nikita, NBC’s Lipstick Jungle, and NikeWomen.com. Arrica Rose was born in Southern California’s San Fernando Valley. She grew up listening to big band, classic rock and folk (her parent’s record collection) as well as punk and all its post-punk related genres (her own collection). And she loved all equally. Her first band, however, was an all girl punk-rock trio she started with friends as a teenager. Upon graduating high school, Rose took a short hiatus from music to attend film school. While in film school she kept gravitating back to music, scoring her own shorts as well as her classmates. After graduating college she made the decision to make music her main focus and put together the backing band that would eventually become The …’s. She also started her own label (pOprOck records) to release her recordings and still does so today. In addition to her music projects, Arrica Rose is founder of I HEART Inc, an artist- operated non-profit organization that raises money for charitable programs via creative projects and events. I HEART Inc helps independent artists give back to their community and in the process exposes them to new audiences as well as fellow artists utilizing their art to effect change. Rose has garnered an amazing team of sponsors and supporters for these projects and events including Willie Nelson, Crosby Stills and Nash, Iron & Wine/Sub Pop Records, Rachel Maddow, Jack White, Fran Drescher, Jackson Browne and many more. 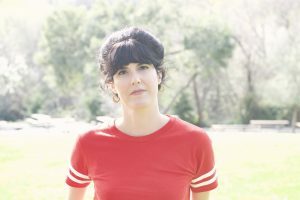 Currently, Rose travels back and forth between Los Angeles, where I HEART Inc and The …’s are based, and Oakland where her alt-country project, Dear County, is based.